The Museum partners with NASA and the Raleigh Astronomy Club to help you see the big picture — of the Universe! From comet crafts to solar observing, lectures to rocket launches, space enthusiasts of all ages will find something to do at Astronomy Days. You don’t want to miss this year’s theme: the Sun and other stars! Show your membership card in the Acro Café and the Daily Planet Café for 50% off smoothies during Astronomy Days! Try our complete menu of astronomy-themed smoothies including Milky Way, Solar Flare, Black Hole and more. Europa’s global ocean contains twice the liquid water of all Earth’s oceans combined, and this moon of Jupiter may be the most likely place for the first detection of extraterrestrial life. The new Europa Clipper spacecraft mission has recently been approved by Congress, including a mandate for a lander to be included as part of the mission. Ages 12 and older, please. Dr. Treuthardt will discuss some of the strange galaxies observed in the Universe, including the newly discovered PGC 1000714, and what they can tell us. Ages 12 and older, please. Since the advent of the optical telescope, ordinary people have made extraordinary contributions to astronomy. This presentation highlights these advancements and explores how you can get involved in discovering our universe. All ages are welcome. The Sun’s gravity ensures that many asteroids and comets move on paths that can intersect the Earth. Most of the resulting cosmic impacts are inconsequential but some are devastating to life, as new evidence reveals. Ages 8 and older, please. Presentation sponsored by NC Space Grant. On Monday, Aug. 21, 2017, the moon will pass in front of the sun and cast a shadow upon all of North America, creating what could well be the best viewed eclipse of all time. Solar eclipses occur when the moon blocks any part of the sun and – weather permitting – the entire continent will have the opportunity to view this once-in-a-lifetime eclipse. NOTE: This is a Skype presentation. Ages 12 and older, please. Dr. Smith will present some of the current astronomical techniques and tools used to observe young stellar systems that are still in the formation process. She will include some of her latest research results from observations at the Keck Observatory. Ages 8 and older, please. The total Solar Eclipse of August 21, 2017 is a once-in-a-lifetime event for most of us. Learn how you can best see it, what to expect, where to go and strategies for staying ahead of the weather. All ages are welcome. 11:00am: Can Kinetic Impactors Save the Planet? The European Space Agency (ESA) and NASA are working together to create a mission to impact the moon of an asteroid… and watch it up close. Can the things we learn protect our planet from disaster? Ages 12 and older, please. Discover some crucial ways the Earth is affected by our biggest and closest neighbors: orbit, rotation, axis, tides, currents, winds, solar storms and more. All these things profoundly influence life as we know it on our planet. Ages 12 and older, please. 1:00pm: Is the Sun Reaching Middle Age? Recent studies of the Sun and other solar stars have hinted that the Sun is entering a new evolutionary phase which would significantly affect its magnetic field. Ages 12 and older, please. For the past 21 months, the Dawn spacecraft has been orbiting Ceres, the biggest protoplanet in the Main Asteroid Belt of the Solar System. We’ve discovered all sorts of things, like bizarre ice crystals and subsurface oceans; what can they teach us about how planets are structured? Ages 12 and older, please. Tips on how to get started in astronomy and what you can observe from your own home. All ages welcome. A look at this year’s exciting developments in the commercial space industry, with a focus on SpaceX and Orbital Sciences, as well as the Commercial Crew projects. All ages welcome. 10:30am: How Do We Know the Ages of Stars? A billion here, a billion there — hear about state-of-the-art advances in how astronomers can turn a pinprick of starlight into an estimate of a star’s age. All ages are welcome. NASA studies our Sun and alien suns in many ways. Why? And what have we learned? Two spacecraft missions specifically, Genesis and Kepler, are highlighted in this presentation. All ages are welcome. This presentation will describe the top 10 ways our Sun and other stars can kill you. NOTE: Some material may be inappropriate for young audiences. Ages 12 and older, please. A humorous look at the good and bad science in recent space movies. All ages welcome. Did you know there are currently dozens of NASA spacecraft along with spacecraft from space agencies in Europe, Japan, and India exploring our solar system and beyond? You’ll learn about their most recent discoveries and what to look forward to in 2017. All ages welcome. The latest news about Gravitational Waves, Lenses, Black Holes, Dark Energy and Matter, and other things. Ages 8 and older, please. Qualls will discuss the key features of the OSIRIS-Rex mission to visit the asteroid Bennu and return a sample to Earth for analysis, and will update the mission since its launch. Ages 8 and older, please. A look at NASA’s human spaceflight plans for the 21st century, with a focus on NASA’s new crewed vehicle, Orion, and the new heavy lift launch vehicle, the Space Launch System. All ages welcome. Solar Eclipses aren’t just a fantastic event to observe and enjoy, they are a rare opportunity for doing real science. You’ll learn more about how revealing the sun’s atmosphere enables study of magnetic fields and even as a test of Einstein’s general theory of relativity as well citizen science opportunities you can contribute to. All ages welcome. A brief history of Mars as compared to Earth. Overview of the MAVEN Mission. Outline of the scientific results relating solar activity to the loss of the Martian atmosphere. Scientists have long believed Mars was once “Earth-like” with a dense atmosphere and liquid water, a theory supported by recent rover missions on the red planet’s surface. The MAVEN spacecraft was sent to investigate the mystery of the missing Mars atmosphere and the impact of the solar wind on Mars. Findings from the mission reveal the mechanisms that over time have dramatically reduced the density and affected the composition of the Mars atmosphere as we see it today. All ages are welcome. There are two rovers exploring Mars currently. What have they found? All ages welcome. Pluto is still providing surprises to scientists. Learn about the latest news of this far away world. Ages 8 and older, please. Asteroids are the remains of incomplete planet formation, and thus provide keys to the processes and materials that created the Earth and other rocky planets. Meteorites are samples of asteroids, and their various types can be related to the history, structure, and compositions of their parent bodies. Ages 12 and older, please. Activities and classroom-ready materials aligned to the NGSS. Ages 12 and older, please. Here’s a behind-the-scenes look at the amazing world of Kennedy Space Center in 1969 as 24,000 people got Apollo 11 ready to fly to the Moon. We’ll also look at some actual equipment from the launch control center. Book signing to follow presentation. Ages 12 and older, please. Binoculars are a very convenient tool for observing the night sky, and they provide excellent views of many celestial objects. Learn how to use binoculars to observe the night sky. Ages 12 and older, please. How to most effectively use the visit to the planetarium to enhance learning opportunities and enjoy the visit. Also, find out what planetariums can do to enhance science instruction. All ages welcome. Create a rocket masterpiece and launch it sky high outside on the plaza! Members of the Raleigh Astronomy club will be bringing telescope equipment to SAFELY observe the sun. Ask questions about astronomy, find out about the event and learn about the local Raleigh Astronomy Club and how their activities have contributed to Wake County communities since 1978. View a display of low-cost astronomy equipment for Astrophotography. Learn about known exo-planets and their characteristics, detection methods (radial velocity, light curves, Kepler Space Telescope), and amateur detection efforts. Learn about and input values into the Drake equation and play with a LEGO orrery. Learn about an exciting camp this summer at the Town of Cary: two weeks of fun and discovery with Space ID (Innovation & Design) and Space EDventure. Light pollution affects all of us on the planet, from astronomers to sea turtles. Find out about this environmental issue and what you can do to help bring back the night sky! Learn the ‘hole’ story! From the surface of Earth, to the moon and other celestial bodies, discover the origin, speech and size of the meteors that caused these impressive pockmarks throughout the universe! Come join an inspiring, educational family hobby with an un-paralleled safety record. We’re looking for people just like you! Check out this interactive Flash animation covering everything in the universe from the fabric of space-time (the Planck length at 10 to negative 35 power) to the world we know measured in meters & kilometers to the estimated size of the universe (≈ 10 to 26.6 power). Purchase this year’s shirt with its awesome new design! Themed face painting with aliens, galaxies and other celestial inspired designs. Come learn about why ultraviolet (UV) light makes your skin darker and craft a bracelet that has a special surprise when you expose it to sunlight! Be an astronaut in training! Space-themed activities for our youngest visitors and their families. Build a DUPLO space station, search for constellations and finish planetary puzzles. Have you ever wondered how the constellations got their names? There are 88 constellations in the sky and many of them are named after animals! Come meet some of these critters and learn about the mythology and natural history of the animals, as well as how constellations provide a map of the night sky. This exhibit contains an interactive demo on how stars are made, and an activity to make a scale version of the solar system that can fit in your pocket! We’ll have several posters depicting club activities as well as large prints of astrophotography and some demonstrations with “hands-on” activities. Fun interactive physics demos for all ages. Come and see what is possible from your backyard! Artist Tim Christensen shares his astrophotography and his wonder of space and time. Hands-on demonstrations for different fields of physics and astronomy for all ages. SAS® CodeSnaps: use coding to navigate a robot through an obstacle course! Join the SAS® Curriculum Pathways® team to code robots through an obstacle course using SAS® CodeSnaps. Coding is a snap with this new free app — a collaborative approach to coding that is fun for all ages! Hands-on activities, exhibits, and learning modules emphasize the vital connection between solar power and life on Earth. View a display of the different types of amateur telescopes from simple to complex. Can you create an amazing robot or spaceship from found materials? Try your hand at creating your own special machine or recreate a model of the lunar lander or Mars rover! Get ready for the 5th annual NC Statewide Star Party, April 21–22, 2017. Twelve men have walked on the moon. Learn about their adventures and the Apollo missions between 1969 and 1972; the last manned space flights beyond low earth orbit. Learn how people found their way across the featureless oceans and deserts of the world using celestial navigation. You will be able to try out ancient tools like the cross staff, quadrant, Ottoman sun compass as well as more modern devices like the sextant and laser. Discover the techniques used by ancient scientists to determine the distance to the moon and planets, and the size and weight of our planet. The Museum’s SECU Daily Planet is 70 feet in diameter and is very likely the world’s largest satellite-image globe. Using the same scale, this exhibit displays the depths of the ocean and tectonic plates, the height of the mountains and atmosphere, and the comparative bio-masses of most life forms. Learn about the history and uses of constellations and then use a flashlight to head out into “space” to track down some constellations right here in the Museum! Want to know more about the exciting astrophysics research happening at the museum? 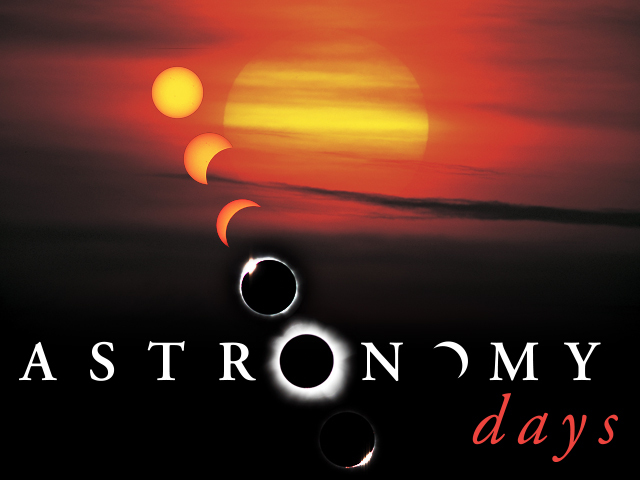 The Astronomy & Astrophysics Research Lab will open its doors during Astronomy Days weekend! Come meet the scientists, students and volunteers working on a range of research and outreach projects focused on understanding the cosmos and sharing the excitement of their astrophysics discoveries! Watch astronomers use everyday supplies to make an out-of-the-world comet. Learn a little about the history of comets and their importance to life here on earth. Demo times TBD. What are meteorites made out of? Learn about meteorites and check out thin sections of meteorites under a microscope! Operate a real radio telescope in western North Carolina from NCMNS. Discover the patterns in the spectra of stars and explore what we know about the surface of the Moon and Mars. Stop by the NASA activity tables to learn more about how to view the 2017 Solar Eclipse! Activities for all ages include constructing a solar viewer and investigating size and distance models for the Moon, Sun, and Earth system. See our star up close at Astronomy Days! Astronomers will set up solar telescopes on the 4th floor terrace of the Nature Research Center to safely view the Sun with special filters. You’ll see fascinating solar surface features and solar storm ejections, and possibly a few sun spots! Scientists and experienced volunteers will be on-hand to explain and answer questions. 1:30pm–2:30pm, both days, weather permitting.